NASA's Transiting Exoplanet Survey Satellite will fly in a unique highly-elliptical orbit to search for exoplanets around the nearest and brightest stars. WASHINGTON — Cameras recently installed on a NASA spacecraft designed to look for nearby exoplanets will be slightly out of focus once launched, but the agency said that will not affect the mission's science. 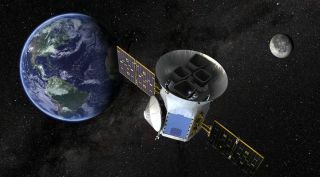 NASA confirmed July 26 that the focus of the four cameras on the Transiting Exoplanet Survey Satellite (TESS) spacecraft will drift when the spacecraft cools to operating temperatures after launch next March. The problem was noticed in recent tests when the cameras were chilled to approximately minus 103 degrees Fahrenheit (minus 75 degrees Celsius). Chou added July 28 that the out-of-focus area is limited to the outer edges of the image, and that "recent testing shows that the camera focus towards the image center is better than originally designed." The problem with the TESS cameras came up during a July 24 meeting of the NASA Advisory Council science committee in Hampton, Virginia. Alan Boss, an astronomer with the Carnegie Institution, brought up the issue in a summary of a meeting of the Astrophysics Advisory Committee, of which he is a member. "That could have some big effects on the photometry," he said of the focus problem. "This is certainly a concern for the folks who know a lot about photometry." TESS will use those cameras to monitor the brightness of the nearest and brightest stars in the sky, an approach similar to that used by Kepler, a NASA spacecraft developed originally to monitor one specific region of the sky. Both spacecraft are designed to look for minute, periodic dips in brightness of those stars as planets pass in front of, or transit, them. In a photo posted to Twitter July 25, technicians pose with the four cameras that will be installed on the TESS spacecraft. Chou said that since TESS is designed to conduct photometry, measuring the brightness of the stars in its field of view, "resolution is less important compared to imaging missions like Hubble." However, astronomers are concerned that there will be some loss of sensitivity because light from the stars will be spread out onto a slightly larger area of the detector. "The question is how much science degradation will there be in the results," Boss said. "The TESS team thinks there will be a 10 percent cut in terms of the number of planets that they expect to be able to detect." Despite the reduction, Boss said TESS scientists believe they will still be able to meet the mission's primary science requirements, and thus there is no need to fix the cameras. The four cameras were attached this week to a plate that will later be installed on the spacecraft, which is being assembled by Orbital ATK. "There will be some loss of science, and we just want to know more about it," Boss said. That includes anything the project can do in software, or even mechanical fixes to the spacecraft, to compensate for the focus problem. NASA has not disclosed the cause of the focus problem, but Boss said it may be due to crystallization of the glue used to bond the detector arrays in place. He said project engineers didn't expect the focus to continue to drift after the temperature stabilized. Chou said the project will continue to monitor the problem. "Should further testing reveal the cameras are unable to complete the mission, NASA will revisit the decision and determine the steps moving forward," she said. TESS is scheduled to launch no earlier than March 2018 on a SpaceX Falcon 9 rocket. That launch was previously planned for late 2017 but postponed by delays in SpaceX's launch schedule and the NASA launch certification process. TESS will operate in a unique orbit that takes it between 67,000 miles and 232,000 miles (108,000 and 373,000 kilometers) from Earth. The orbit is particularly stable, thus minimizing the maneuvers the spacecraft has to perform to maintain it. The spacecraft will have a two-year primary mission, and scientists expect it to detect thousands of exoplanets, including dozens the size of the Earth. Astronomers plan to follow up some of the most promising discoveries with the James Webb Space Telescope and the Wide Field Infrared Survey Telescope.